Discussion in 'News and Announcements' started by JWTech, Nov 2, 2017. 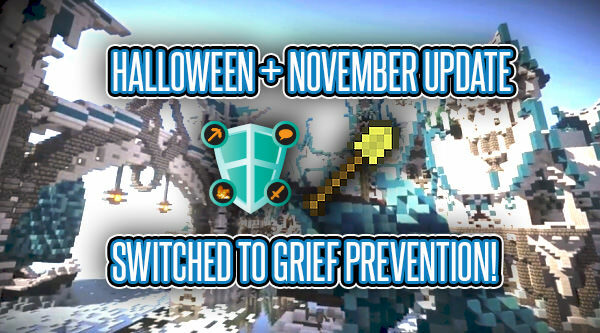 After a slight delay, we're proud to announce that the "Halloween" update, now being referred to as the "November update", has been finalized and is now done! With this, the largest change is the switch to GriefPrevention (GP) as our protection system instead of the Nations system we used previously. This is due to the fact that GP tends to be much easier to use, has much more support for mods than Nations, and recently has even added support for Towns, allowing both a personal and Town claim system. For the following week, both GriefPrevention and Nations will be usable on the servers to give people a chance to switch their Nations to GP themselves. Any Nations that do not change to GP will have their Nation bank refunded before Nations is removed, to ensure that you'll still have plenty of coins for GP. Our protection system guide ( https://www.serendipitymc.com/threads/1110/ ) has also been updated to reflect this change and now includes information on how to use GP. With this change, the costs for maintaining claims with GP will be cheaper for some, and more expensive for others, as it now calculates upkeep by the amount of blocks you are using in your claims. Each block costs 0.5 coins to maintain. So a 100-block claim will cost 50 coins to maintain, while a 500-block claim will cost 250 coins. Use more, pay more, use less, pay less. We've also pushed some of the plugins we've been testing on the Expanse server over to the others, including new ClearLag and Trails (gotta have those aesthetics) plugins. More updates soon to follow, and be sure to stay tuned for the fundraising event with the Extra Life charity on the 4th of this month!